The Australian Beef Sustainability Framework has backed Meat & Livestock Australia’s commitment yesterday that the red meat industry should aim to be carbon-neutral by 2030. “The prospect that we could be carbon-neutral by 2030 is an incredibility exciting one in terms of demonstrating our economic and environmental credentials to Australia and the world,” said ABSF sustainability steering group chair, Bryce Camm. 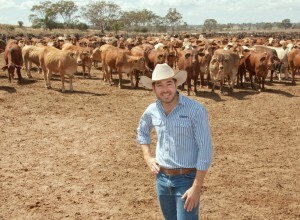 “Reducing emissions is one of the key priorities of the ABSF, and work is already in progress by a large number of producers and most processors,” said Mr Camm, a fourth-generation Queensland grain and grassfed beef producer. In September, following widespread consultation, the ABSF’s Sustainability Steering Group selected managing climate change risk as one of six high-priority areas in sustainable beef production. In the framework, ‘managing climate change risk’ covers GHGs, fertiliser application and fossil fuel use (both on-farm and in processing) and carbon capture and sequestration. Independent chair of the Red Meat Advisory Council Don Mackay said yesterday that the red meat industry had reduced emissions within the national greenhouse inventory from 20pc to 13pc since 2005. “We are proud to have significantly contributed to the Australian Federal Government 2030 targets under the Paris agreement. But, as ever, more needs to be done when it comes to policy settings that drive real value for red meat businesses,” he told stakeholders. The ABSF is an initiative of RMAC aimed at demonstrating to the community the commitment to a thriving Australian beef industry that strives to continuously improve the wellbeing of people, animals and the environment. Once you accept the idea that beef production is not sustainable or that you need to prove beef production sustainability……….you have lost the battle. Nature and natural processes have been proven to be sustainable for tens of thousands of years………..why would we accept that certain men have decided otherwise? The arrogance is unbelievable. There is no future for the extensive beef industry in Australia the way things are going. Now we have yet more “groups” paid for in one way or another by industry to essentially destroy the industry. When you look into the whole “emissions” debate especially when it comes to agriculture, you quickly learn everything is made up. The numbers are made up, made up at it is based on modelling rather then measurements. Science is the study of facts, yet when it comes to climate change facts go out the window and they use “modelling” and the term “consensus”. Now consensus is a word used only in politics, it is not used in science as science deals in facts not opinion. It is extremely astonishing how in the past thirty years the beef industry in Australia has been turned into a huge bureaucrat’s dreamland and plans are to make it more unprofitable for the producer as he has to pay more money into the beef bureaucratic industry. The irony is beefcentral recently had an article on young beef producers. My advice to them is find another industry to work in as there will soon be no money in beef unless you work in the bureaucratic sector.